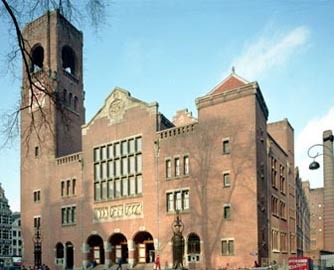 We are hosting CHEP in the Amsterdam landmark building Beurs van Berlage, right in the city centre. Only 500m from the Central Station and 20min by train from Schiphol airport. On this page we'll try and give you some hints and ideas on how to get there easily! You can print this guide if you want, or download it as a single page. CHEP starts Monday 14th at 09.00 CEST (UTC+0200), closing on Friday 18th at 12.15. Your airport of choice is Amsterdam Schiphol Airport (IATA: AMS). On arrival, follow the sign to the arrival hall, proceed through immigration (for non-Schengen arrivals, usually done in 1-5 min), and pick up your luggage (if any): once you exit the customs area you cannot get back in. 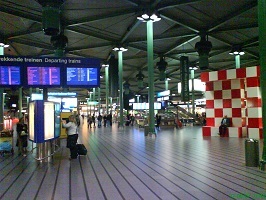 Schiphol has a single-terminal concept: all piers and gates are interconnected by moving walkways. It does not matter which exit you take, all of them drop you in "Schiphol Plaza", the shopping centre and transport hub in the middle of the complex. As you enter the plaza, there are ATMs to get your Euros (€, current rate of exchange 1.35 US$/€, 134 ¥/€, 1.24 CHF/€). Unless you're a frequent traveller to the Netherlands, don't be tempted here to use a public transport chipcard ("OV-chipkaart") for your train trip: you need at least a €20 deposit to use it in trains. For use inside Amsterdam there are convenient day passes (from €7.50 per 24 hours) available in tram, bus and metro. Amsterdam Central station is linked to major cities in Germany, Belgium and France through high-speed links. There are trains from Berlin (ICE every 2 hours with change in Hannover, once daily direct); every 2 hours to Cologne, Mainz, Frankfurt, and Basel (changing trains in Cologne, ICE reservation required); and every hour to Brussels and Paris (Thalys, reservation required). There are also regular intercity trains from The Hague to Brussels (every 2 hours, via Rotterdam). The CHEP venue "Beurs van Berlage" is a historic monument, conspicuously located on the main artery between Central Station and Dam Square. It's impossible to miss: the large brick building with its bell tower takes up over half of the left (east) side of the avenue "Damrak". The entrance is in the middle of the building, at Damrak no. 243. When leaving central station, take the exit city-bound (southwards, away from the ferries), and walk towards Dam Square alongside the canal cruise boats and the tram lines. After 400m you'll see the Beurs on the left (and after 50m the Roode Leeuw hotel on your right). If it's Monday to Friday: enter now at no. 243. Otherwise, walk along to Dam Square and look at the Palace (formerly town hall) and enjoy the city! The venue, the central station, and all down-town hotels (all except Ibis Amsterdam City West, see below) are within walking distance. On the Wednesday afternoon you will probably want to use one of the trams or buses. For this, buy a from the conductor or driver for €7.50. You can also buy these in advance in metro stations, "GVB" ticket machines. 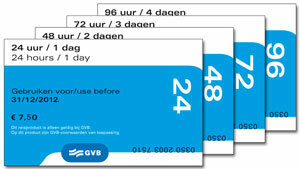 There are also 48, 72, and 96 hour cards (5-day and 7-day tickets are available in VVV shops or maybe at your hotel). If you're staying at Ibis Amsterdam City West: walk the 1 km to "Sloterdijk" station, taking the road due south from the hotel towards the railroad and then follow it westwards (13 min). All trains from platform 5, 6, 8, and 12 take you to Central Station. A return trip (valid on the day only) costs €4.20 (and a one-way trip costs half that). Trip takes 6 minutes, and then another 6 minute walk to the venue. So leave the hotel at 08.30 at the latest. Also inside the city, avoid the use of taxis: they're even more useless than on your way from the airport, hideously priced, and are mainly interested in killing off their competitors (and taking the unfortunate customers with it). There are trams everywhere (for longer distances there's also the metro), and they will take you anywhere you would conceivably want to go. The detailed ensemble prediction (showing uncertainties based on perturbed input conditions) by the KNMI. Top left graph shows precipitation ("neerslag"), the bottom left one temperature at 2m height. Amsterdam Museum - all about the history and preeminence of Amsterdam! Rijksmuseum - Nachtwacht and Rembrandt, but also a lot more and definitely worth exploring! Palace on Dam Square - yes, you can get inside! Amsterdam Expo 25 years of Pixar - only during CHEP! Stedelijk - modern art and installations, just re-opened! Zaans Museum and Zaanse Schans - if you want to eat mustard, get close-up to a windmill, want to fight one, or want to look at the house of my great-grandmother at no.8 (and please be nice to the local cyclists). explore one of the many historic neighbourhoods or parks, such as: De Jordaan, Vondel Park, Hortus Botanicus, or Artis Zoo (and park). Want to know more about Amsterdam and its opportunities? Plenty of time left? You can consider going to Haarlem (20min by train), and visit the historic centre and our oldest museum (Teylers) with a working static electricity generator and set of Leyden Jar capacitors (although seldom demonstrated still worth looking at even when idle). The same museum also features plenty of other historic physical instruments as well as an extensive collection of natural history objects, drawings and paintings. Or pick your trips to Monnikendam or Marken. If you just want to get to a restaurant and don’t care about the sort of food you get, head for the Reguliersdwarsstraat, the narrow street that runs between the Koningsplein and the Rembrandtplein parallel to the flower market. Here you’ll find Indonesian, Argentinean steak, Mexican, Indian, and garlic-inspired food in plenty. Also, most of the restaurants here are actually quite reasonable, as most of the tourists tend to get trapped elsewhere. Many pubs can also be found through the rest of the city. Try a few in the Jordaan, just west of the city centre around the Westermarkt and beyond. And in “de Pijp”, around the Ferdinand Bol straat and the Heinekenplein. By far the best beer can be found at Amsterdam's local breweries Brouwerij 't IJ - a large variety of great beers and ales, slightly outside of the centre but impossible to miss next to an in-city windmill. The sampling room and cafe is open till 20.00 daily (so get there early). Or head to De Prael, 2 min from the venue at the Oudezijds Voorburgwal and a tasting room (Oudezijds Armsteeg 26) open until 24.00 Tuesday - Saturday (Sundays: till 23.00, closed on Monday). Rembrandtplein: on the square itself again are tourist traps. But take one of the side streets (Utrechtse straat, Reguliersdwarsstraat) and you’re OK again. Rokin (the street between Central Station and Dam Square): a chain of tourist traps interspersed with fast-food chains. There are a few good hotels (our De Roode Leeuw is OK! ), and the “Febo” at the end close to Central Station is worth having a look at for anthropological purposes, i.e., just to be able to see a snack wall... or grab a quick bite of course. There are plenty of sandwich shops (“broodjes zaak”) in Amsterdam, but supermarkets nowadays also have a good selection of sandwiches and meals “to-go”. Albert Heijn is the largest of them, with a big supermarket just behind the Palace on Dam Square. 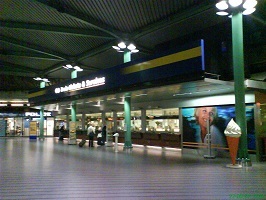 There are “AH-to-go” shops in many of the larger train stations, such as Centraal Station and Amstel. Near the Spui in the city centre, “Broodje van Kootje” has a large selection of fresh sandwiches, laden with old Dutch cheese (the real stuff, not the plastic-tasting fake-Gouda you see in the rest of the world), cured ham and fish. Eat your sandwich on a bench in the Begijnhof (see above) if the weather allows it. Another option is one of the all-day markets in Amsterdam. There are two worth mentioning: the Albert Kuyp market (in the “De Pijp” neighbourhood, just south of the inner ring road), and the Dappermarkt in the East. The Albert Kuyp has, incidentally, also the highest density of heron birds, waiting for the end of market to get their bellyful of fish, French fries and mayonnaise. Very popular and central: De Jaren overlooking the Amstel river, or you could try De Kroon (upstairs on Rembrandtplein, extremely crowded on weekends if I remember correctly). But there are plenty of cafes and bars on the canals as well (try the west side first, around Singel the Westermarkt). Also there are plenty of places to get good coffee, and you should not have trouble finding a decent espresso in any cafe, restaurant, or in dedicated coffee places (Coffee Company, D-E-Cafe). And even one of the two Seattle, WA, US based chains can be found if you're so inclined. Although much more satisfying than, for example, the Breton “crepes”, having just a single pancake for dinner will leave you wanting for a sizeable dessert. But then, most places will have ice cream or fruit sorbet to complete your meal. Pancakes are also a good alternative if you long for a quick bite in the afternoon. Actually, many of the pancake restaurants in the Netherlands in summer get most of their customers from touring cyclists and families longing for a filling at lunchtime or as an alternative for a tea-time snack. The Pancake Bakery (Prinsengracht 191, 020-6251333, 3-course menu around €20 excl. drinks) – one of the larger and certainly the most well-known restaurant in Amsterdam is does tend to attract a lot of tourists, but offers a wide selection of pancakes and omelettes. Restaurant Pancakes! (Berenstraat 38, on the corner with the Prisengracht in the Jordaan, 020-5289797, menu around €18 excl. drinks) – new-style pancakes with not only traditional but also exotic varieties. Apparently including Surinam roti, according to one local commentator on dinnersite.nl. Slightly out of the tourist area. De caroussel (Weteringcircuit) – near the inner-city ring road and the Heineken museum, it’s not a place you would go to for dinner. But if you are strolling around the area between Leidseplein, Frederiksplein and the Ferdinand Bol street, you could well drop in here for a bite. It is sometimes said that this is as close to the traditional Dutch dish as you’re likely to come. Indonesian and Chinese-Indonesian (“Chinees-Indisch” in Dutch) restaurants are amongst the most frequent in the Netherlands, both for eat-in and take-away. Only in the last 10 years did the take-away Chinese have to give way to pizza couriers that deliver your dinner at your door step. In the 1950, the large influx of people from the Dutch-Indies changed the Dutch dinner landscape forever. With then-exotic tastes and large quantities, the “chinees-indisch” restaurants took over. Kantjil en de Tijger (Spuistraat 291, 020-6200994, € 25 for main course) – right in the city centre, opposite the Spui and near the main shopping area, this one is easy to get to. Desa (Ceintuurbaan 103, € 25 main course) – one of the better Indonesian restaurant with and excellent “rijsttafel”. Out of the city centre and the tourist areas, but still quite close if you know how to get there. Tempo Doeloe (Utrechtsestraat 75, 020-6256718, menu around € 40) – quite a busy place off the Rembrandtplein area. Reserve a table if you’re going to be in a large group. Sahid Jaya (Reguliersdwarsstraat 26, 020 - 626 37 27, menu around € 40) – along one of the better streets for authentic restaurants, this restaurant serves good Indonesian food and is (hopefully) not yet spoilt by tourists. If you are still looking around, most of the Indonesian restaurants you’ll see are quite fine, except for those in the known tourist trap areas (i.e., those around the Leidseplein and immediately around the Rembrandtplein). There are plenty of mediocre steak houses around, largely in the tourist areas. Avoid these, and head for a steak house a bit further from the main roads. The reguliersdwarsstraat again is a good bet. Roses Cantina (Reguliersdwarsstraat 38-40, 020-6259797) – good authentic Mexican food. You may have to wait a while to be seated, or be served for that matter, but the quality of the food is great. Amsterdam’s China Town is around the Nieuwmarks and the Zeedijk. There is a whole bunch of traditional (i.e. non-indonesian) chinese restaurant here, with Nam Kee being the most famous. And the Dutch movie “The Oisters of Nam Kee” based on the book of Kees van Beijnum will not have lessened their popularity one bit. As far as I remember, it was a good restaurant which was frequented by ethnic Chinese and locals alike, so it’s worth giving it a try. And if you don’t like the ambiance, pick any of the other restaurants around it. Nam Kee (Gelderse Kade 117, near the Nieuwmarkt, 020-6392848; and Zeedijk 111-113, 020-6243470) – arguable one of the most famous Chinese restaurants. Todays it attracts more and more non-Chinese, but still the food is good. Memories of India (Reguliersdwarsstraat 88) – quite OK Indian food. At least used to be quite popular with locals and students, although I’ve not been there for ages now. At some point you'll unfortunately have to leave, likely through Schiphol Airport again.Make your way to Central Station and buy a ticket (again €3.90). Trains stopping at Schiphol Airport are clearly indicated, usually leaving from platforms 14a and 15 (Fyra: no supplement needed for Schiphol) every 5-10 minutes (trip takes 17 min). Most airlines do electronic check-in, and mobile boarding passes. Contact the registration desk or your hotel reception in case you need a tree-derived (paper) boarding pass printed. Travelling with hand-luggage only, for flight inside the Schengen area allow 60 min for the security check and getting to your gate (it may be a long walk). For non-Schengen destinations, allow 60-90 for passport control and security (at the gate). 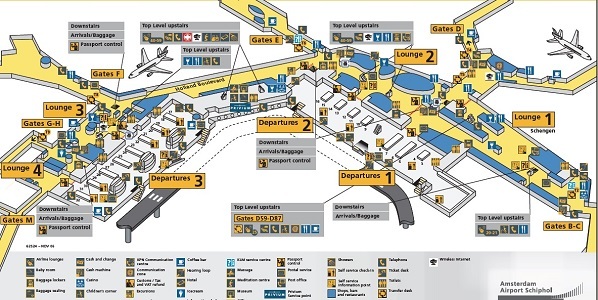 Once at Schiphol, if you are travelling to the Schengen area (gates A, B, C, D59-87 and M), there is of course no immigration check, but a baggage security check is done immediately, as you enter the passenger-only area (full of shops). If you are travelling outside the Schengen area (gates D1-58, E, F, G and H), you pass through immigration only and are dumped into the shopping area. Security checks are done at each gate individually (so as long as there are other people queuing for your plane, you don’t need to ...) The entry to the Schengen area is at "Departures 1", most major airlines from Europe leave from "Departures 2", whereas most budget carriers and many US carriers (but not Delta), use "Departures 3". See the map to find out where to go. Airline lounges are all on the upper level (‘Level 2’), with KLM and SkyTeam having one lounge in the Schengen area and two lounges in the non-EU area (one near the E gates, one nearer to the F gates). Level 2 between the E and F gates is also the place to go to if you want a relaxing chair in a quiet spot. Just opposite the airline lounges are some very nice publicly-accessible chairs. If you are culture-starved, you can explore paintings in an annex of the Rijksmuseum for free, on Holland Boulevard between gates E and F, after carefully negotiating your path through the inevitable shopping circus that surrounds it.